Wow! Look at those crisps! When deciding what to serve with French Dip Sandwiches, my mind kept wandering to Houston’s Best. Sandwich. in. the. Free. World. I love the teeny, tiny, crispy french fries they serve as the side dish. In fact, Houston’s is one of only two places I even eat french fries. Steak N Shake is the other, but that’s largely do to the cheese sauce. I simply can not get enough of that stuff. When I do run through a drive through, I tend to order a combo by number because it’s easy, and since they all went over to the combo ordering technique, I can’t even find the names of the burgers on the menu any more. Those evil fast food marketing geniuses trick me into ordering fries I eat three of then throw away every last time. The problem with homemade french fries lies in the frying part, which is a royal pain and in the end costly (gallons of oil), smelly (home fragranced by eau de McDonald’s for days), and wildly messy (oil disposal resulting in bags of oily kitty litter, and oil all over the floor, stove, counter, myself not to mention run away fears of plumbing nightmares and whole rivers of fish being destroyed due to spent oil sneaking its way into the groundwater.) The other problem is they taste absolutely awful if they aren’t served within 1 minute of being cooked. All these headaches aside, I was still foolishly considering trying to pull of this absurd feat, but reason prevailed and I let Marti talk me out of it. Of course, her solution of buying frozen to be oven baked fries wasn’t good enough, since, well, I’m a masochist and all. Since I’d already mentally committed to using my mandoline (yep that site’s in french but at least the picture will give you a glimpse if you have no idea what I’m talking about) to prepare the fries, it was an easy leap to consider for Oven Baked Chips. 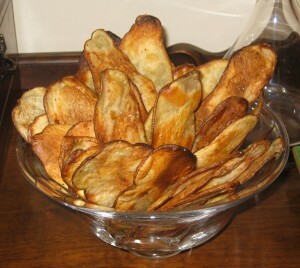 The recipe for Rori’s Potato Chips can be found on page 77 of the Barefoot Contessa Parties Book. The problem is – the picture is on page 72. So foolishly, I failed to glance back at the picture prior to setting up my mandoline. I also didn’t have a ruler out, but now that I’ve pulled one out, I feel fairly confident that my slices were pretty close to 1/16th of an inch, they certainly weren’t anywhere close to an 1/8th of an inch. My advice would be to use the smallest setting on your mandoline, getting your slices as close to paper thin as you can. So this is where my timeline suffered irreparable damage. The recipe calls for 26 minutes total cooktime at 325 per batch. Mine took closer to 32 minutes – and that was after I raised the oven temp 75 degrees. So if your potatoes are paper thin, follow the recipe. If they’re any larger – cook at 400 and cook the first side for 12 minutes, turn pans cook 12 minutes, and then the second side for 10 minutes. It’s actually very easy to tell the timing. They will not be crisp unless they’re brown, and they’re ready to come out as soon as you start to see browning. At the end of the day, I think these chips added at least two hours to my timeline. Two hours that could have been recovered if I had a double oven. On the upside, I discovered and embraced a couple of perks of my older urban home. I can make it to the liquor store, purchase a handle of sweet tea vodka, a bottle of creme de cacao, and a Black Box Cabernet, run into and chat with a neighbor, then make it home and back inside in four and a half minutes. Take that dry neighborhoods. I can make it to the grocery, purchase 2 bottles of horseradish, 16 sandwich rolls (most of which would later be burned) then be back at the stove inside 9 minutes. That is true convenience. Preheat the oven to 325. Spread each of 2 baking sheets with 1 tablespoon of oil and put them in the oven to preheat for 10 minutes. Slice the potatoes on the narrow side lengthwise on a mandoline so that they are paper-thin and flexible. Place slices on the hot sheet pans, making sure that they don’t overlap at all. Sprinkle with salt and pepper. Bake the chips for 10 minutes , rotate the pans in the oven and bake for another 10 minutes. Flip each chip and then bake for another 5-6 minutes or until golden brown. Remove the chips to a paper towel to cool. Repeat with the remaining potato slices. To store the chips, cool completely and place in a plastic zipper-lock bag. They will stay crisp several days. Never miss a fresh post on Dinner and Conversation! Subscribe today.